Another element of the revenue question is how much to build content inside apps – applications that come pre-loaded and that people can download to the devices. Many believe that apps, purposefully built for the touch screen environment, better set up for reading (at least initially) and offering the ability to read offline, would appeal to users and perhaps provide a way to begin to monetize digital content in the mobile space in a way that has proven elusive on conventional computers. This could be particularly important for smartphones, where the efficacy of advertising is even more of a question because of the size of the screen. But apps also require a whole new set of programming for each operating system and screen size, which means more staff and budget resources. The survey finds that while apps are pervasive on mobile devices, they are far from the universal choice, at least for news. In fact, over the last year, tablet news users moved more toward browsers. The survey even revealed some confusion over what apps even are. When tablet news users were initially asked if they had news apps on their tablet about half, 48%, said yes. The other half of tablet news users who initially said they did not have news apps (52% overall) were provided with a definition of an app and then asked again if they have any. An additional 22% of tablet news users (71% of those who received the follow-up question) then said they in fact had news apps. These users, however, were far more likely to turn to the browser than the apps for news – and to display tablet news habits more in line with other browser users. Overall, the majority of mobile news users get most of their news on mobile devices through browsers – 60% of tablet news users and 61% of smartphone news users. Less than half as many, 23% of tablet news users and 28% of smartphone news users, mainly go through apps. And 16% and 11%, respectively, say they use apps and the browser equally. Use of apps is greater on Apple devices – for both tablet and smartphone news users. Fully 72% of tablet news users who use apps and the browser equally have an iPad, as do 66% of those who mostly use apps. Among those who mostly use the browser, about as many have an Android tablet (49%) as have an iPad (52%). For smartphone news users, it is just those who mostly use apps who are more likely to have an iPhone, 54% versus 36% among than those who mostly use the browser and 35% of those who use both equally. 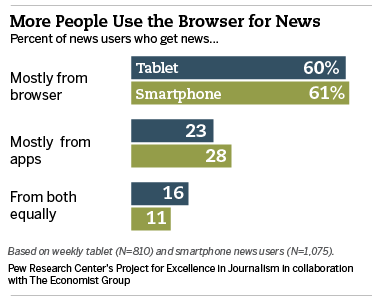 In the summer of 2011, browser use was already more popular for news on the tablet, but to a lesser degree. At that time, 40% said they mainly used their browser versus 21% who mainly used apps, while 31% used both equally. We also saw in 2011 among tablet owners that even if these app users were a smaller group overall, they were in many ways more engaged news users; they got news more frequently, spent more time doing so and added new sources. A year later, as browser technology has improved and browser use for news has increased, do we see the same kind of power user among those that favor apps? The data in this survey suggest yes, app users are still more engaged with news. Tablet news users who mostly use apps and even those who use apps at least as often as the web browser stand out from those who mostly use their browser. 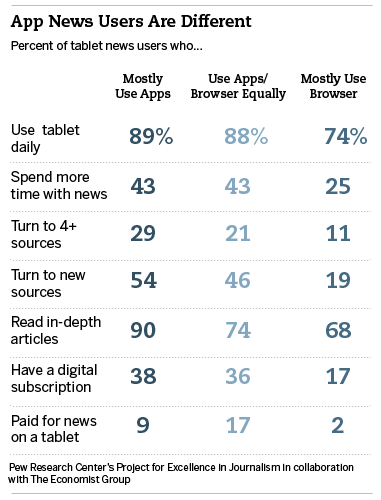 First, people who use apps for news are more likely to use their tablet every day. In all, 89% of those who mostly use apps get news on their tablets daily, as do 88% of those who use apps and the browser equally. Fewer, 74%, of those who mostly use their browser get news daily. And they are more likely to be adding specifically to their news time. Fully 43% of those who mostly use apps, and 43% of those who use apps and the browser equally, say they spend more time getting news now that they have a tablet (versus 25% of those who mostly use the browser). App news users also turn to more sources – 29% of those who mostly use apps and 21% of those who use both equally and regularly – get news from four or more sources, compared with just 11% of those who mostly use the browser. And, they turn to new news sources. About half of mostly app users (54%) and those who use apps and the browser equally (46%) get news from new sources. Just 19% of mostly browser users say they get news from new sources. There are also a few places where app-only tablet news users stand out even from those who use both equally, and vice versa. Mainly app tablet news users stand out for their in-depth news habits. Fully 90% read in-depth news articles at least sometimes, compared with 74% of those who use both equally and 68% of mostly browser users. And fully 83% of mainly app users read in-depth articles they were not initially looking for (versus 74% of those who use both equally and 67% of mostly browser users). App news users also stand out from browser users in reading one or more articles at least a fair amount of the time when they are checking headlines (82% of mostly app users and 80% of those who use both equally versus 63% of those who get news mostly through their browser). Those who use both equally seem to have a greater appreciation for what technology can bring to the content. They are nearly evenly split between wanting a traditional print-like experience and wanting interactive components (49% to 51%) while those who mostly use apps lean more toward wanting a print experience (63% to 37%). Perhaps most promising for news organizations, the data suggest that tablet news users who use apps to either degree are more likely to pay for news. They are about twice as likely to have a digital subscription – 38% of those who mostly use apps and 36% of those who use both equally have a digital news subscription-compared with just 17% of tablet news users who mostly use the browser. And those who use news apps on the tablet are more likely to have paid for news there, with those who use the browser and apps equally the most likely of all: 17% of that group said they have paid for news on their tablet, versus 9% of mainly app users and just 2% of mostly browser users. There are far fewer differences between those who use apps on their smartphone and those that mostly use their browser. But when it comes to news activities, those who mostly use apps or use both equally are more likely to check headlines and read in-depth articles. Fully 83% of those who use both equally read in-depth articles on their phones, as do 73% of mostly app users. That compares to only about half, 52%, of mostly browser users. But on two other activities – just those who use both equally stand out. They are more likely to watch news videos (54%, versus 29% of mainly app and 29% of mainly browser users). They also are more likely than the mainly apps users to receive news through email or social networking (54% vs. 40%). 8% said they didn’t know what they used. The analysis that follows of app versus browser users is based on those who initially answer yes to having news apps. Those who answered no are included in the group who mainly uses browsers.